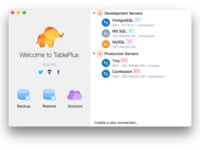 A native tool with elegant UI that allows you to simultaneously manage multiple DB such as PostgresSQL, MySQL, SQL Server, Amazon Redshift, SQLite, MariaDB and more. Pros: Aesthetically and functionally, this is the best SQL editor for Postgres. It has all the features you need and also looks great! Cons: I don't like not being able to rearrange the connections on the left-hand side. I also don't like how the name showed for the connections are of the database name, and not of the connection itself. Pros: Easy to use, allows you to have multiple tabs open which is helpful when trying to reference the table structure you are querying. Also really helpful that it points to the exact location of any errors, instead of making you read through a lot of code to find it. Cons: Cancelling a query that is currently running takes way too long, and I've found that just letting the query time out is usually faster than trying to cancel mid-run. Pros: TablePlus is a great MySQL administration tool. We used to use the free Sequel Pro, but it crashes on Macos Mojave and so we looked for an alternative. TablePlus seems to do the job perfectly and is much faster than SequelPro. After playing with the free version for 15 minutes, it was a no-brainer to purchase the full version. It's good to know that by paying we can help the developers to maintain and improve the software. Overall: Full-featured and fast MySQL (and more) administration tool! Pros: I enjoy very much the SQL Editor, it's great for doing test, and the software itself it's pretty easy to use and customizable. Cons: Not much to complain about, every now and then you might get a little bug but the developer team and the support service is very good. 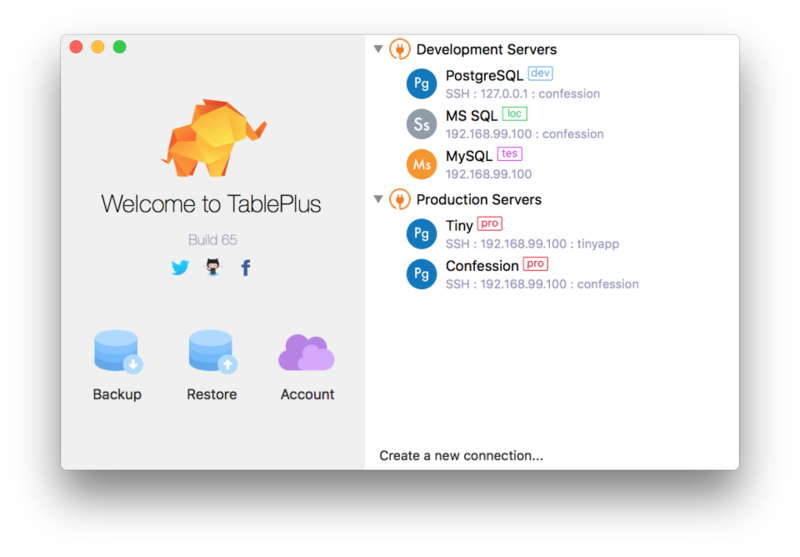 Pros: I've tried TONS of cross platform SQL viewers and editors and found that by far TablePlus was the cleanest, most functional piece of software I used. The UI lets anyone (even those who don't use SQL), query the database. Cons: No sharing features like POPSQL had. Also the backup function is a little confusing to use. Pros: East of use and the interface is super simple. This software is faster then any other pgAdmin that I have used. Cons: You will see some bugs, but this is offset with great support and a development team not scared to talk with customers. Pros: Small package size comes with high performance. TablePlus also supports new shortcuts binding like Sublime Text or Slack for navigation that keeps my hand on keyboard. Pros: the best part about this software is that TablePlus works with many RDBMS. The software is relatively also easy to use. Cons: i really don't have anything i do not like about the software, but there is still room for improvements.